Oh yes! 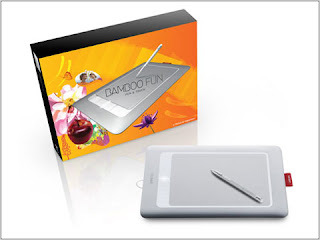 I hve finally ordered my Wacom Bamboo Fun tablet! It cost me £174 but I think it's worth it! Ok, so I shoulda just bought a cheap basic tablet but hey, I have my student loan so I'm supposed to buy stuff like this for my design work! Plus, if you are aware of this product, you know how much more this baby can do! So yeah, I'm looking forward to getting this so my design work will be a lot better! So look out for a review of the tablet when I have had a play and look out for the reviews, I have downloaded all the soundtracks so I can post some songs up too because I love all of... ooo say 3 of my readers?